BURUCİYE MEDRESESİ - Solvotek Mühendislik ve Bilişim Hizmetleri Tic. Ltd. Şti. BURUCİYE MEDRESESİ - Solvotek Mühendislik ve Bilişim Hizmetleri Tic. Ltd. Şti. Buruciye Medresesi is in citadel Sivas and was built in 1271 by Muzaffer Burucerdi of Iran as a school teaching physics, chemistry and astronomy.Its magnificient crown gate is one of the best examples of Seljuk architecure in Anatolia. On the left of the entrance, the tomb of the builder of the Medrese lies in the room decorated with blue and black tiles. 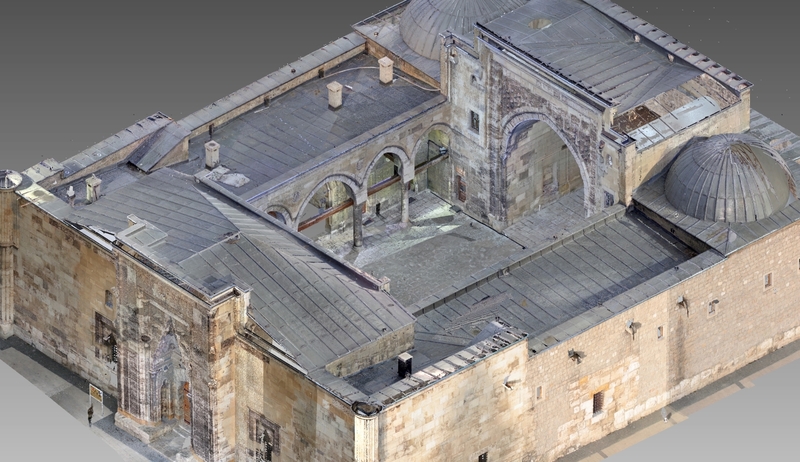 Solvotek was requested to 3D laser scan the medrese document the stone work on the doors and tiles and decoartions in high detail. High resolution pointcloud that is colored with HDR imagery was the perfect fit for this job. Very detailed and high resolution colored point cloud was created and section, plan and elevation orthophotos were delivered to be used in asbuilt drawings.